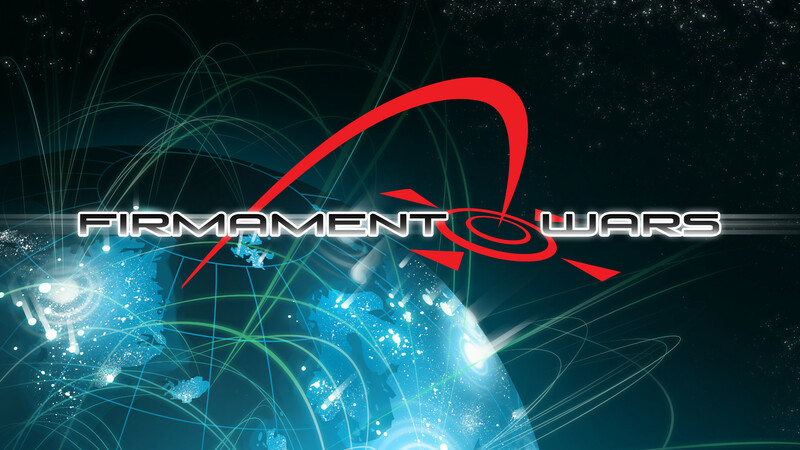 Firmament Wars is an multiplayer realtime strategy game developed by Neverworks Games, an independent browser game development company. 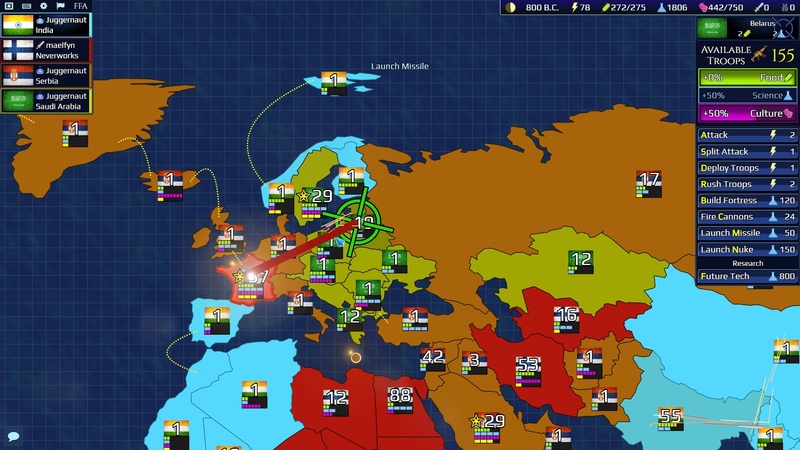 Firmament Wars became available on Steam via Early Access on July 23rd, 2018. Firmament Wars is scheduled for full release on Steam for Windows on August 8th, 2018. Before the game begins, players start in the lobby where players may choose from seven different governments, each of which has four distinct attributes. Once the host has started the game, a countdown begins, the screen fades, and all players transition to the game. The game begins with all players starting in their capital city with a palace structure. The palace provides a permanent defensive boost to your capital and helps players avoid early elimination. Players must expand outwards to claim rewards, territory, and resources. Players should target nearby barbarian villages because each village provides a reward, such as additional energy, production, food, or culture. Additionally, barbarian tiles always have special resources that attracted the barbarians to that location in the first place. For this reason, claiming these tiles as fast as possible is of key strategic importance. 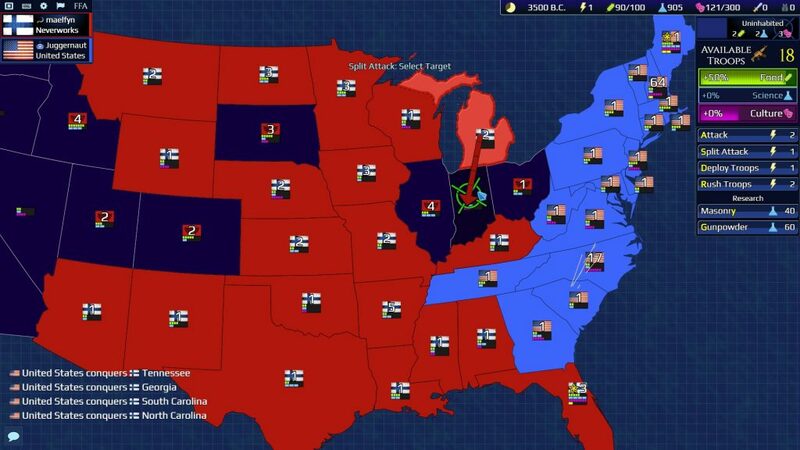 Unlike some other real-time strategy games, there is no fog-of-war. You can see the status of all tiles at any time. You can see who controls each tile and the number of troops. All player activity updates in real-time on the map and can be seen in plain view by all players, though some data does remain secretive. For example, other players don’t know how much resources, great people, or technology you have. They also don’t know the upgrade status of your troops. Great Generals and Great Tacticians can improve the effectiveness of your troops depending on if you’re attacking or defending, respectively. I put a lot of work into the social environment. I wanted it to be easy for players to communicate. That’s why I created chat rooms that prominently display their flag and account name. When you initially load up the game, you join a default channel, but you can use chat commands to join a private channel. Simply type the command /join brochat, and you now have a place where you can meet up with buddies, chat, and discuss what type of game you want to play. Private messaging is also available, regardless of whether you’re in a chat lobby, game lobby, or playing a game. Send anyone a message using @account hello syntax, or /w account hello. One of the best features is the ability to click on any player’s account name in a lobby to check their rating. It will return all public information about the player including their rating, and their win/loss record in all game modes. This data can also be retrieved when the player is offline by simply typing /who account. You can also add friends to your /friend list, up to 20 at a time. You can type /friend to check the online status of everyone on your friend list, and even see where they are in the game. And, of course, for the inevitable troll that won’t stop spamming you after getting wrecked head-to-head, there is the /ignore list to block all of their messages. 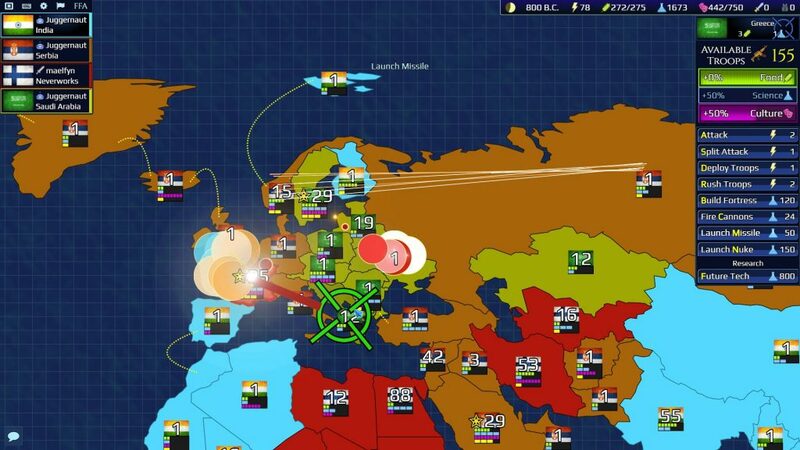 Firmament Wars features a competitive head-to-head ranked mode. All players start at a 1500 rating. Winning will increase it, and losing will decrease it! A matchmaking system automatically matches you up against a similarly rated player. Points are adjusted accordingly after the match based on each player’s performance with due consideration given to each player’s skill level. The top ranked players are displayed on the leaderboard along with their account name, flag, nation name, wins, and losses. Disconnect ratios are also displayed, so this will give players a chance to refuse matches against players who disconnect too often. Free For All is the “normal” game mode, but after you get your feet wet in Free For All, you’ll definitely want to try out Team Mode where you can play 2v2, 4v4, 7v1, or even 2v5v1! Whatever combination of teams that are possible with eight players are possible in the Team Mode! 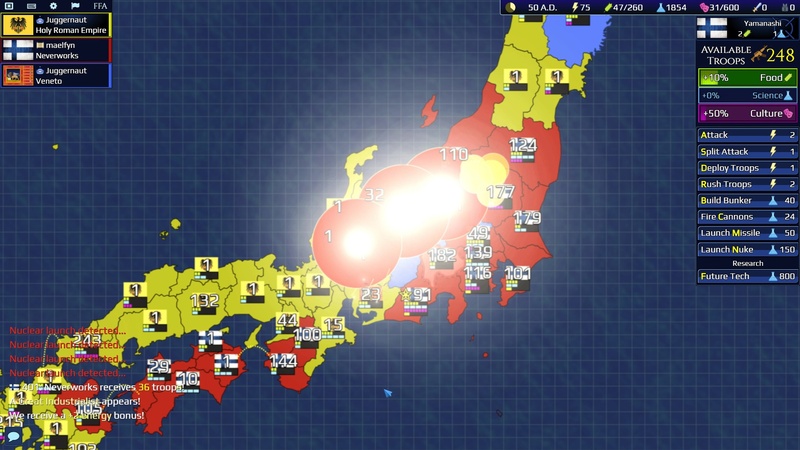 Like many other popular real-time strategy games, Firmament Wars allows you to set the speed of the gameplay. Slowing down the game speed is a great way for new players to get comfortable with the gameplay. Though it’s also a great way to play more of a “simulation” style of game, where players have more time to evaluate their decisions instead of a fast-twitch style of gameplay typical in games that use the fastest setting. Game speed adjusts the maximum turn duration for all players. A turn will also end instantly when all players have spent their energy. This can speed up gameplay considerably if players desire, but also allows players to stall the game when they need more time to execute their strategy. You can also unlock achievements, which are even displayed as military ribbons during the game. So the more achievements you unlock, the more impressive you ribbon rack will be! This is a great incentive to rack up achievements and it fits well with the game’s military theme. 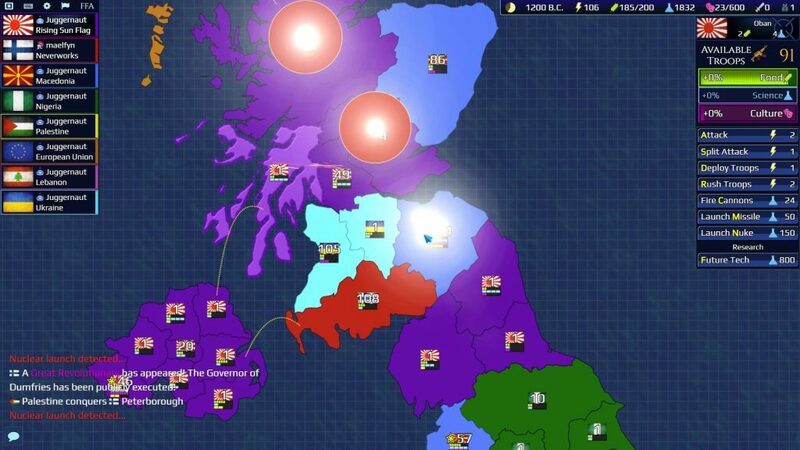 Firmament Wars is a fast-paced real-time strategy game unlike anything else offered in a web browser. 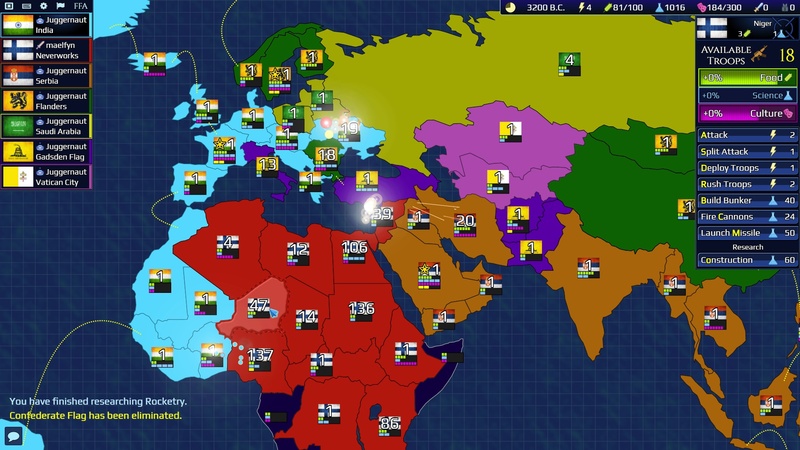 It combines the army-based gameplay of Risk, the strategic management of Civilization, and the synchronous real-time turn gameplay of Civilization Revolution. Up to eight players can compete at once in FFA, Team, or Ranked modes.